We have put together a fantastic offer for clubs at a very affordable price from £140 it is open to clubs of all age groups ability and male or female. This is an itinerary that we have arranged for this year for Nerja on the Costa del Sol, 50 kms east of Malaga . 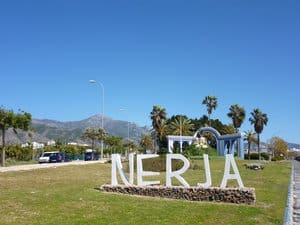 Nerja is approximately 45 minutes from Málaga Airport and offers various Restaurants and Cafe Bars and is a small town of 22,000 inhabitnts of all nationalities of the world. The town is used to welcoming international guests. The accommodation is a 3 star Bed & Breakfast about 5 minutes from the beach. and town. Other standards of accommodation can be arranged ie Half Board/Full Board. teams commitments and availability of pitches. We can also arrange for Qualified Coaches to take training sessions if required at an extra cost. It is very important to know the standard of football of your team as this reflects in the games that we can arrange for you. In addition to the Nerja itinerary we also organise Tours to Estepona & Marbella, prices on request. The price you see does not include flights but does include Airport transfers & transport to and from matches. We advise that 2 games are ample for the time that you spend on Tour for 5 days. We will arrange the Tour to suit your needs. Training equipment will only be provided if the Qualified coach takes the sessions, if you do not wish for the Coach you must bring deflated balls, cones & training bibs. Please note that the venues for Evening meals are at an extra cost to yourselves and subject to change.